Good news for the owners of Moto M, now the users can Update Moto M to Android 7.0 Nougat. The official Nougat firmware has started rolling out recently. The users of Moto M are getting OTA notifications. A number of the users have already updated their device. Also, you can update your device to Nougat Official firmware. We will show you a simple step by step guide to get OTA and update Moto M to Android 7.0 Nougat. The OTA is in progress and in phases, In your region, the OTA may available. However, you have ignored it or your update interrupted via a slow network connection. So, you can still install it using this simple method. And here you will learn the complete method of how to Update Moto M to Android 7.0 Nougat OTA Officially. The OTA is available or not you can check it anytime from the device settings menu. If the updates are available, then accept it and install this latest firmware. The Nougat firmware for Moto M is stable and bugs free build. It has packs all the latest features and performance improvements of Android 7.0 Nougat. And of course, you can taste the new and enhanced experience of Nougat on you Moto M.
Android Nougat has already been provided for several Motorola devices. And now the Moto M is getting Nougat official build. 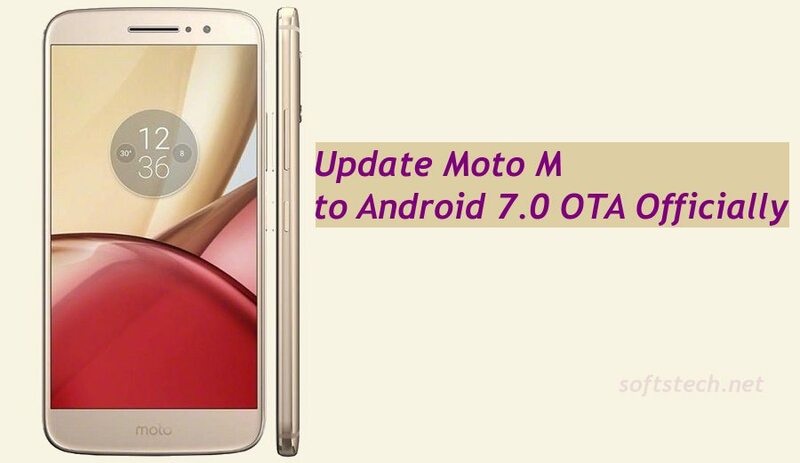 If you are interested and are ready, then here everything, follow the entire steps accordingly to Update Moto M to Android 7.0 Nougat OTA. Note: This guide is intended only to Update Moto M to Android 7.0 Nougat OTA Officially. So, don’t try for any other purpose or any other device. Also, entirely flash and proceed at your own risk. Update Moto M to Android 7.0 Nougat OTA Officially. Perform a full backup of the existing data on Moto M. Like contact, gallery items, text messages and app data etc. Also, make sure that the battery of Moto M has at least 70% charging level. This OTA updates is for Moto M users only, so you should have Moto M device. Also, the network connection and data connectivity must be strong to download 900 MB of updates. Go Settings > About-> System Update-> check for update > Confirm to Install. Your device will download and install the updates. Time required for this process is depending upon your data connection speed. So that’s how to Update Moto M to Android 7.0 Nougat OTA Officially. If there is any issue, don’t hesitate to contact us via the discussion section below.